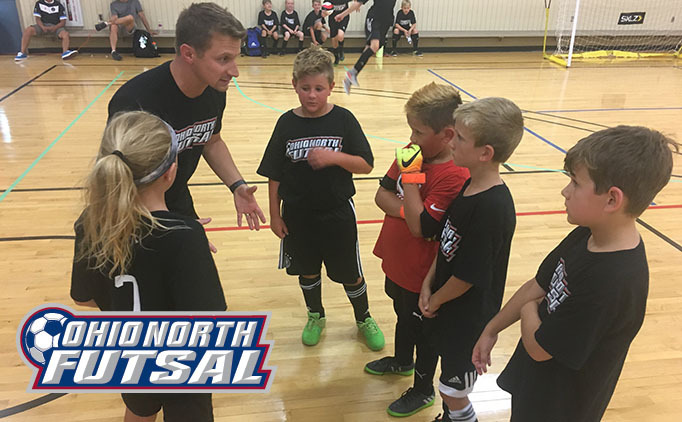 Ohio North Futsal was created to promote the game of futsal in northern Ohio and to share the value that the game of futsal has to offer in the development of youth soccer players. Otto Orf, Ohio North Futsal Director, is available to consult and to perform clinics, camps, educational courses, tournaments and other programming to all Ohio North members. For more information or for questions regarding futsal opportunities in your community please contact Otto Orf at 330-329-5883 or otto@ohionorthsoccer.org. For questions or for more information, contact Otto Orf, Ohio North Futsal Director, otto@ohionorthsoccer.org. The course will consist of 6 hours, 3 classroom & 3 on court hours. Participants will receive an Ohio North Futsal coaches polo. Participants will receive a Futsal Factory futsal coaching board. Participants will receive the Ohio North Futsal Level 4 coaches manual. Participants will receive an Ohio North Futsal Level 4 Coaching Certificate. Futsal started in 1930 when Juan Carlos Ceriani Gravier, a teacher in Montevideo, Uruguay, created a version of indoor football for recreation in YMCAs. This new sport was originally developed for playing on basketball courts, and a rule book was published in September 1933. His goal was to create a team game that could be played indoor or outdoor but that was similar to football, which became quite popular there after Uruguay won the 1930 World Cup and gold medals in the 1924 and 1928 Summer Olympics. 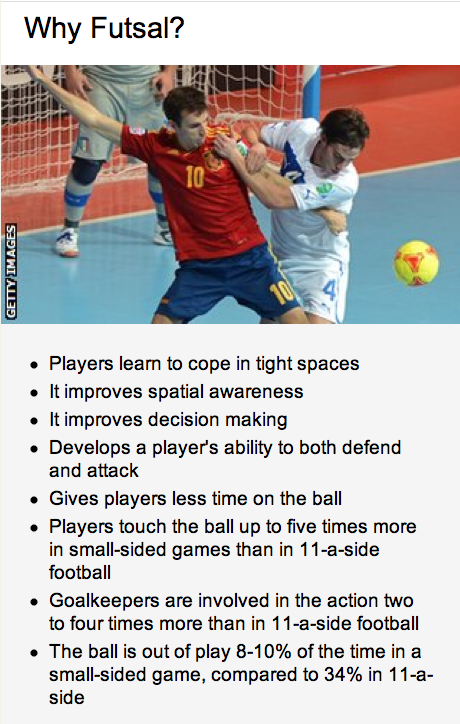 Futsal is an exciting, fast-paced small sided football game that is widely played across the world. The nature of the game places a large emphasis on technical skill and ability in situations of high pressure, and is subsequently an excellent breeding ground for soccer competencies that can be translated into the 11-a-side format of the game. Futsal is a five-a-side game, played on a flat indoor court with 3 meter by 2 meter by 1 meter goals and a smaller, reduced bounce ball. The use of this special ball keeps the ball on the court and at the feet of the players much more frequently promoting the ever important foot skills needed in soccer and futsal. Futsal is played to touchlines and a goal-line and all players are free to enter the penalty area and play the ball over head-height. International games are played with 20 minutes per half, played to a stopping clock (similar to basketball) with 1 time-out permitted by each team in each half. Youth league games are usually played with a running clock using 20-25 minute halves.